Hello Friends, thank you for stopping by! One huge reasons I have been rather scarce this year is that I have been quite a bit of designing, as in quite a bit. And many of the designs are starting to become official! Last week, I shared with you Chelsea. 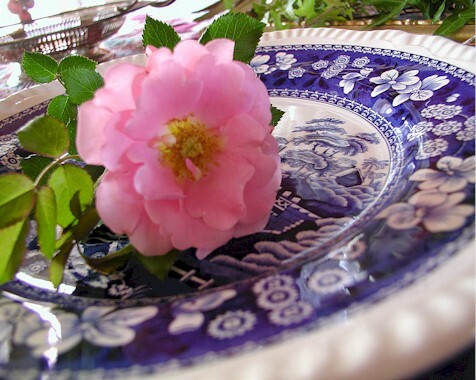 This week, I am happy to share with you Charlotte…. a vision of blues! This is a lap sized quilt that I designed with beginners in mind. Click here if you haven’t read my thoughts on designing with beginners in mind. Click here to view the entire Charlotte collection. And you must know I simply adore blue!!! 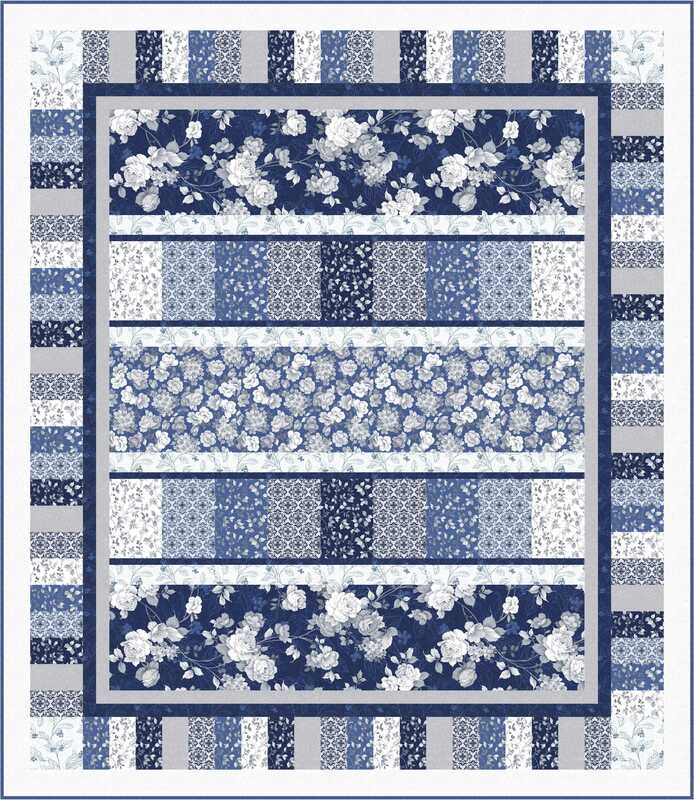 This entry was posted in Quilt Pattern, Quilting, Quilts: Pieced and tagged Beginners Quilt Patterns, Free to use Quilt Patterns, Pieced Quilts, Quilting Treasures Charlotte, Wendy Sheppard Designs. Bookmark the permalink. Gorgeous! Great use of fabrics, and easy to teach to others, yet still looks pretty. 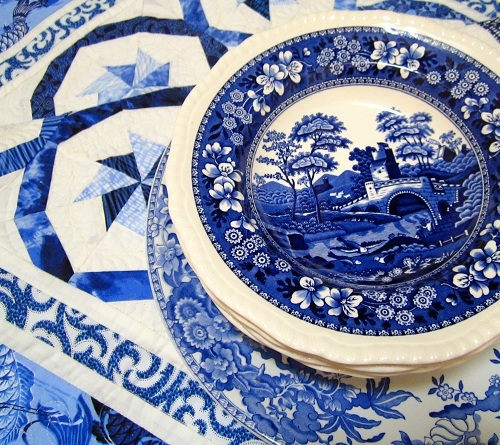 I adore blue, and blue and white quilts. I’m working on one that’s a sampler style. There’s something so pretty and crisp in them, and I love G’s dress, and the second to last one. YIKES on the price of the fabrics. Guess I better look thru my stash real close. It is pretty tho. 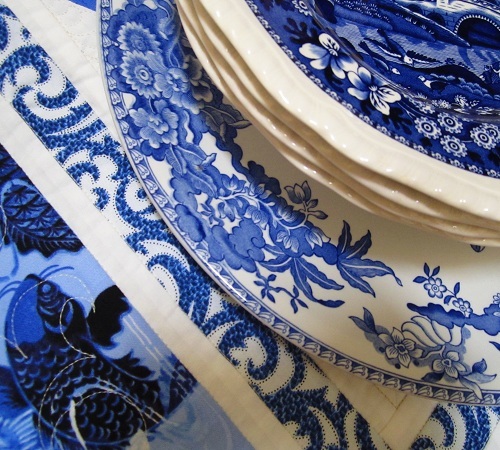 Raising both my arms and waving because I love, LOVE blue especially cobalt blue and white dishes. I love this nifty quilt pattern. Another one I will print up. Does Miss Baby still fit in that dress? 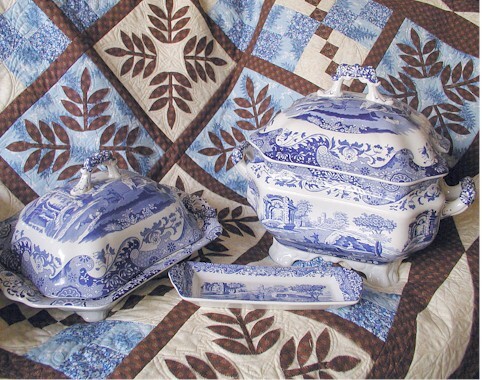 I love each one of these quilts, and the dishes too. I always love your cheerful updates. Since I have white hair, I love wearing royal and turquoise blue. However, it’s not my favorite in quilts. Blue fabrics have come a long way in being dye fast, but some blues still seem to fade quicker than other colors. That being said, I recently saw a lap quilt with deep blue and lime greens that was heavenly! Made me start a little stash of lime greens! It made the blue really pop. That shocked gown is beautiful! and that would be “smocked”–stupid autocorrect. You have created another wonderful quilt pattern! It may be intended for beginners, but every so often being an intermediate level quilter, I still like to go and do something easier. This would be a wonderful project. Thank you so much for sharing and inspiring. Have a wonderful creative day! Beautiful quilt! I am one of the few who is not a blue fan, it’s green all the way here. However my daughter loves blue. Wendy, what is the name of the pinwheel quilt in the second to last photo? Is it one of your free patterns? I love it. 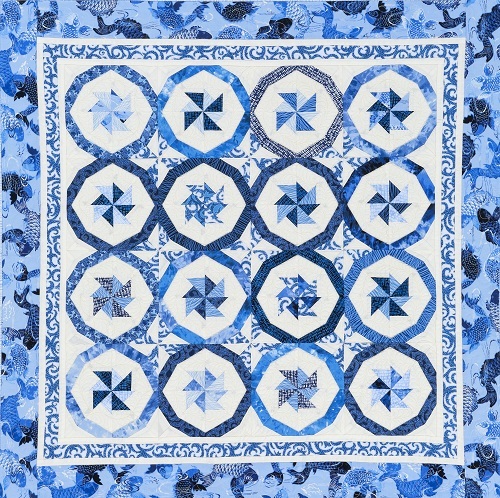 I’m more passionate about purple, but I like the look of blue and white quilts. 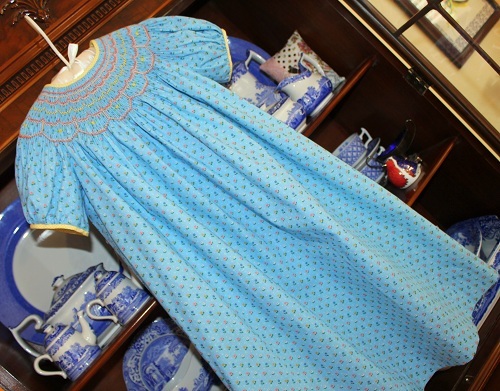 That pattern is called China Blue – it is not a free pattern. It was featured in QUILT, a magazine that is no longer. Your best bet in finding the pattern is to see if you can buy a copy of the magazine on ebay. My readers have had good luck tracking down back issues that way. hand raised. I love all different blues. 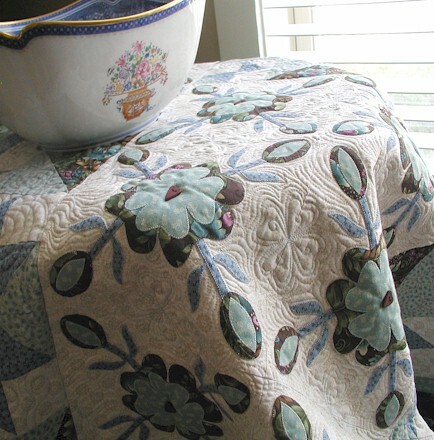 Love, love, love that last quilt on this post with the appliqued flowers! Oh yes…love the “blues”…just gave my HUGE collection of Blue Willow to my oldest daughter….when my Mom and Dad passed last year 6 days apart I inherited their things. Mom was a “pink and green” dish fan so now I’m using her Franciscan Desert Rose just because I miss them so very much…but no room for all those dishes so I shared. The quilt photos are all so lovely but I think my favorite photo is the little smocked dress. Did I ever tell you that you were the inspiration for me taking my first smocking class? Yep…and I love it but not as much as quilting. Blessings…hugs to Miss Baby G.
I’m raising my hand and I do love blue. Unable to download patter. Says it is not available. Beautiful though.